Welcome to Spark Towing’s roadside assistance service! Need a jump-start? A new battery? Some gas for your empty tank? These are all common roadside assistance emergencies, and we have what it takes to get to your car, fix the problem, and get you back behind the wheel. What’s more, we offer these services for the best rates in San Diego. No one else can even hope to beat our competitive rates, which is why our customers wouldn’t even think of calling another roadside assistance company. If you’ve ever been stranded on the side of the road, you know how annoying an experience it can be. Knowing this, we’ve arranged our shifts so that someone is always here to answer your call and send out a licensed and insured roadside assistance specialist. Barring delays we cannot control (traffic delays, for example), it will take our roadside assistance specialists a very short period of time to get to your car and fix the problem. 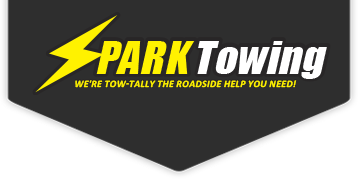 Please remember that Spark Towing is open around the clock—24 hours a day, 7 days a week, 365 days a year. Is it a weekend? Is it a holiday? Is it pouring outside? At Spark Towing, none of that matters, as someone is always here. Within seconds of receiving your call, our dispatchers will send you a fully licensed and insured roadside assistance specialist. We train our employees, all of whom undergo thorough background checks, in every aspect of customer service and roadside assistance work. We also invite you to read about our premier towing and auto locksmith services, all of which are available 24 hours a day, 7 days a week, and 365 days a year.